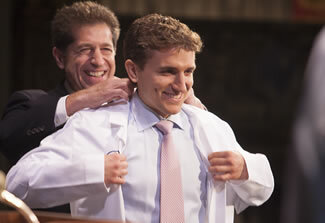 Erik Kleeman receives his white coat from his father Dr. Barry Kleeman. 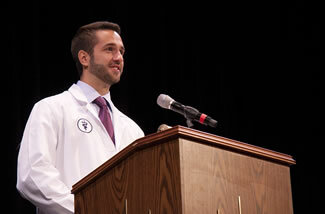 The MU College of Veterinary Medicine celebrated the progression of third-year students from classroom to clinics during the annual White Coat Ceremony on Oct. 16. The event, held at the Missouri Theatre, marked the midpoint in the professional curriculum for 113 students. The first two years of preclinical training included courses in anatomy, physiology, cell and molecular biology, pathology, pharmacology, microbiology, virology and toxicology. The doctor of veterinary medicine candidates also learned fundamentals in clinical disciplines, including anesthesiology, clinical pathology, radiology, public health and medicine and surgery. 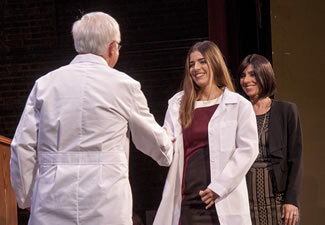 Dean Neil Olson congratulates Heidi Burgos after she is coated by her mother, Heidi Zayas. 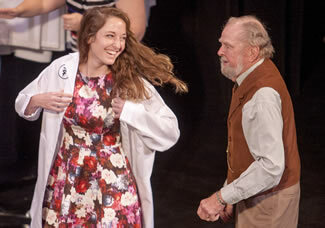 During the ceremony each student had a white laboratory coat, presented to them by a family member, friend or mentor who then assisted their student in donning the coat. The ceremony marked the next step in the students’ education as they will spend the remaining 19 months of the DVM curriculum working in the Veterinary Health Center in the Small Animal, Food Animal and Equine hospitals and the Veterinary Medical Diagnostic Laboratory, as well as completing preceptorships in private practices or with public agencies. Moe Buder coats his granddaughter Jordan Hilton. CVM Dean Neil C. Olson, DVM, PhD, told the class that they are entering veterinary medicine at an exciting time that is marked by rapid change. He urged them to embrace that change, but also reminded them that they are entering a people-oriented profession. 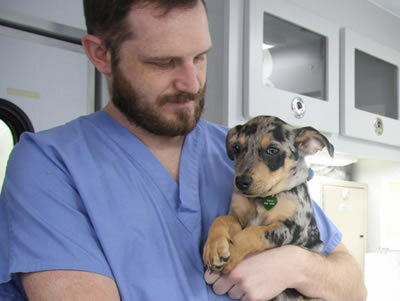 “Your success as a veterinarian will have more to do with your interaction with people than any other variable,” Olson said. Phillip Digasbarro assures his classmates that they will continue to support each other. Department of Veterinary Medicine and Surgery Chairman John Dodam, DVM, MS, PhD, welcomed the students “across the parking lot,” and advised them that they would no longer be able to ask if the material they were learning would be on a future test as their future pop quizzes would be assisting during a difficult calving and caring for a pet that had been hit by a car. “Every conversation with an (animal) owner reflects on our school and on our profession,” Dodam said. Phillip Digasbarro gave the response on behalf of his classmates, thanking family members, friends and mentors for their support. 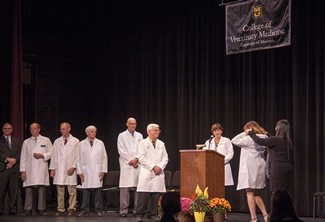 The Missouri Veterinary Medical Association, represented by President Mel Falk, DVM, and Executive Director Richard Antweiler provided lapel pins for the ceremony. 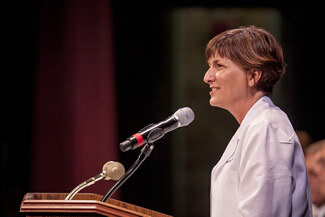 Associate Dean for Student Affairs Angela Tennison, DVM, serves as the emcee for the White Coat Ceremony. The White Coat Ceremony platform party (from left): Richard Antweiler, executive director, Missouri Veterinary Medical Association, Mel Falk, DVM, president, Missouri Veterinary Medical Association, Daniel Shaw, DVM, PhD, professor, Veterinary Medical Diagnostic Laboratory, David Wilson, DVM, MS, director, Veterinary Health Center, John Dodam, DVM, MS, PhD, chairman, Department of Veterinary Medicine and Surgery, Neil C. Olson, DVM, PhD, dean, College of Veterinary Medicine, and Angela Tennison, DVM, associate dean for Student Affairs. Also participating in the ceremony, but not visible in the image, was Linda Berent, DVM, PhD, associate dean for Academic Affairs.